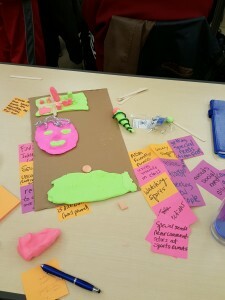 This past class DFA (Design for America) UIUC came and did an innovative workshop with us. They explained their premise of gathering a bunch of individuals from different backgrounds and creating unique solutions for problems in the community. Together, in groups, we had focused on 1 of 4 individual problems that we had needed to create a solution for. The individual that my group had chose was Jess, a blind student at UT Austin. To begin our workshop we brainstormed different problems Jess may have in general while attending college, then looked for similar patterns in our thinking. Then filled out a mission statement of what we were going to do, ours was “To help Jess get more easily involved in social attractions” since we felt that college is such a social place, a blind person may have difficulty of not only getting around but also interacting and hanging out with her peers. Our next task was to design a product that may help Jess in social situations, and one of the main ideas we thought of was how social media is so prevalent in our lives to be able to engage with friends and see what other social events are going on in the community. So we decided to come up with something similar to an iPad that could digitally reform its screen into a brail pattern. This would make it easier for Jess to read Facebook and see any upcoming events. It would also come with a scanner for her to scan peoples faces and understand who she is speaking with. This concept is relative to this week’s reading, Design Thinking by Tim Brown, in the sense that design isn’t necessarily just an aesthetic idea for product innovation. Now, design is the outcome of structured ideas and solutions to problems. This is exactly what we did for Jess, we didn’t think “we’re going to build a tactical iPad” we thought “we’re going to build something that makes social engagements easier for blind people”, our product was just the outcome of our thinking. I feel that this is the whole idea that Design for America bases itself off of, not so much “what can we make today?” but “how can we fix this problem and what needs to be built to fix it?”. This workshop with DFA really opened my eyes to the different concepts of design. Thinking it was just another term for style, I now understand that we can use design concepts to better our community and creatively fix problems we didn’t think were fixable. It gets me excited for future classes and thinking about how we can fix everyday problems we all have. Going forward, I realize now that it is 100% about the user and how we can design a product to work for them and their needs. This entry was posted in Reflections, Week3 by Paige Lee. Bookmark the permalink. I think it’s quite impressive how you walked away from the workshop with a greater appreciation for the user’s perspective. It’s vital to a product’s success that it fills demand for a problem, whether in a novel or cost-effective way. Keeping the user in mind is key to success! 1. How did the brail pattern idea emerge? 2. Has this brail pattern been done in other electronic devices? 3. Would you also add on a kind of earpiece that relays the names of who Jess is interacting with? All in all, I am thoroughly impressed with your team’s idea! I can agree with your “Now What?” I think after the workshop, my definition for design has expanded greatly!